The government's ambitious disinvestment plan may not sail through smoothly. Finance Minister Arun Jaitley. Photo: Shekhar Ghosh. On September 10, the government approved stake sales in three state-run companies as part of its disinvestment programme . The decision to sell shares in Coal India (CIL), Oil & Natural Gas Corp (ONGC) and hydropower company NHPC came two months after Finance Minister Arun Jaitley, in his maiden budget, set an ambitious divestment target of Rs 58,425 crore for 2014/15. On the face of it, the recent bull run in the markets suggests the government can easily meet the target. But there are roadblocks aplenty. 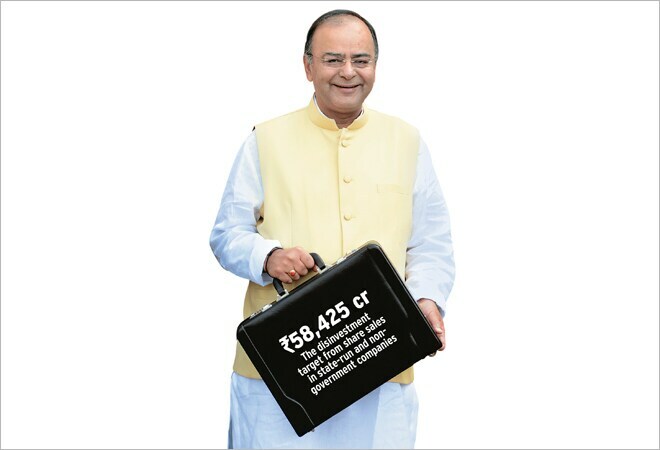 The disinvestment programme is important for Jaitley to meet his target of bringing down the fiscal deficit from 4.5 per cent of gross domestic product in 2013/14 to 4.1 per cent this year. That looks difficult considering that tax collection has not been growing at the targeted pace. For instance, revenue from indirect taxes grew only 4.6 per cent in the April-to-August period as against the 25 per cent increase envisaged for the full year. "The fiscal deficit target is huge. Just one of the approaches won't work," says Anis Chakravarty, Senior Director, Deloitte Touche Tohmatsu India. "Disinvestment is not going to be an easy task either." The divestment target has two parts - Rs 43,425 crore from stake sales in state-run companies and the remaining by selling shares in non-government companies, such as Hindustan Zinc and Bharat Aluminium (Balco). The government plans to sell a 10 per cent stake in CIL, five per cent in ONGC and 11.36 per cent in NHPC, besides a stake in Steel Authority of India (SAIL). The government owns 89.65 per cent of CIL, 68.94 per cent of ONGC, 85.96 per cent of NHPC and 80 per cent of SAIL. At current market prices, stake sales in these four companies can raise almost Rs 45,000 crore. The government also holds a 29.54 per cent stake in Hindustan Zinc and 49 per cent in Balco, both of which are now controlled by the London-listed mining giant Vedanta Resources. While Balco is not listed, a stake sale in Hindustan Zinc alone can mobilise over Rs 20,000 crore based on its current share price. The government, in July, reportedly approved stake sales in the two firms. Some market observers feel there is enough demand for shares of blue-chip public sector companies. Not everyone is convinced though. The biggest concern is the poor track record of the disinvestment programme. In the past four fiscal years, the government mopped up only half the targeted Rs 1.5 lakh crore from stake sales. "It is the same story every year," says Saurabh Mukherjea, CEO, Institutional Equities, Ambit Capital. "Every year, the government announces its divestment targets which it ultimately fails to meet." Some analysts feel investor appetite for PSU stocks is waning. Since September 10, shares of Coal India, ONGC and NHPC have fallen up to seven per cent, indicating that investors expect the merchant bankers to price the issues lower than the current market prices. Besides, PSU stocks will be competing with fresh paper hitting the market in the next few months, say investment bankers. According to some estimates, about Rs 1.25 lakh crore of fresh capital is likely to be raised over the next one year by both private- and public-sector companies, including banks, through initial and follow-on public offerings, and institutional share sales. Another worrying factor is that Coal India is staring at a strike by five trade unions, who oppose the stake sale. Last December, the previous United Progressive Alliance government shelved a stake sale in the Kolkata-based company following opposition from workers' unions. Instead, the government nudged the miner to pay about Rs 19,000 crore of special dividend to make up for the shortfall in the disinvestment target. The lack of clarity on the timeline is also a reason why some analysts feel the target is difficult to achieve. The government hasn't announced the share sale dates yet but SAIL is likely to hit the markets first, sometime in October, followed by Coal India. Ambit's Mukherjea says the government would like to sell shares before the economy, which grew at its fastest pace in nine quarters during the April-to-June period, may begin to show signs of moderation. "The disinvestment will happen soon, before concerns about this fiscal's growth come forth," he says. Although Finance Minister Jaitley has previously expressed confidence of meeting the target, the government's desperation to push through the programme is becoming evident. Recently, it reportedly asked investment bankers involved in the PSU stake sales to stay away from big capital raising work from the private sector. The government is also reportedly planning to double the quota for retail investors to 20 per cent and offer them a discounted price in the share sales. Analysts also caution that aggressive pricing, poor marketing and bad execution could lead to the failure of the disinvestment programme, just like the ONGC share sale in March 2012 when retail and foreign institutional investors mostly stayed away. At the time, state-run Life Insurance Corporation bailed out the issue by purchasing more than half the shares on offer. Analysts fear the government might again ask the insurer to step in if investor response is poor. That is best avoided.